The emerging planet is a gas giant with a mass greater than Jupiter, located some 3 billion km from the central star – roughly equivalent to the distance between Uranus and the Sun. Data also suggests the planet’s atmosphere is cloudy and has a surface temperature of 1000C, making it much hotter than any planet in our own Solar System. The research has been presented in two papers, which will be published in the journal Astronomy and Astrophysics. 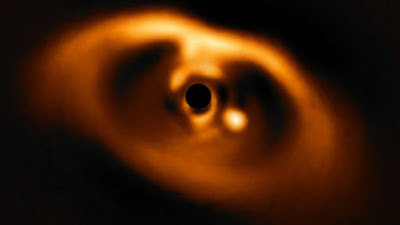 It builds on previous research from 2015 where a number of newborn planets were observed evolving for the first time. Scientists hope the detection will offer greater insight into the early stages of planetary evolution and enhance their overall understanding of alien worlds.